A tribute to her hometown, this collection is anything but renditions of the obvious New York songs. “Manhattan Serenade” is curated: a connoisseur’s compilation of one exquisite, undiscovered musical gem after another. Celia Berk and her arranger/conductor, the esteemed Alex Rybeck, consider themselves to be “musical truffle hounds,” and they have indeed rooted through the Great American Songbook to uncover superb, overlooked songs by the crème de la crème of composers and lyricists: Irving Berlin, Rodgers & Hart, Kurt Weill, Langston Hughes, Richard Whiting & Gus Kahn, Burt Bacharach, Rupert Holmes and Cy Coleman. I have to admit I am flattered to have one of my songs included among those of my songwriting heroes. 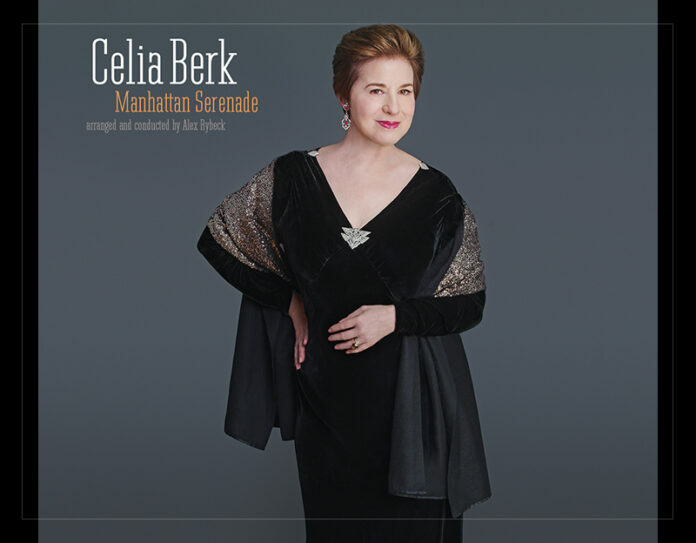 ﻿ There are so many reasons to love this beautiful collection of songs—the lush arrangements, the extravagant orchestrations and, of course, Celia Berk’s knowing vocals sung with charm, warmth and wit. Celia has impeccable taste. She chooses great songs, has superb arrangements and then trusts her material. Her interpretations are honest, unadorned and imbued with intelligence, sensitivity and an intuitive understanding of what she is singing about. And, like the City of New York, with this eclectic and unexpected mixture of songs there is the joy of discovery. The more familiar of these selections have been reimagined. Kander & Ebb’s All I Need (Is One Good Break) from Flora, The Red Menace, which was Liza Minnelli’s break, gets a Latin twist. And a lovely intimate performance of Gerry Goffin & Carole King’s Up On The Roof, shed of its R&B/Pop roots, is reborn as a soulful delight. Irving Berlin’s wacky Manhattan Madness and Rodgers & Hart’s I Gotta Get Back To New York deliver the period punch their creators intended. There is a sly pairing of Kurt Weill & Sam Coslow’s The Romance Of A Lifetime and Rupert Holmes’ The People That You Never Get To Love that becomes a wistful, touching mini-musical play about missed romantic opportunities. And totally new to me is Spring In Manhattan, which is merely lovely. One song being recorded for the first time is The Broadway Song, which Cy Coleman and I wrote for Pamela’s First Musical, an as-yet unproduced musical adaptation of Wendy Wasserstein’s delightful children’s book of the same name. Celia and a chorus of cabaret stars, aided by Alex Rybeck’s witty arrangement and Larry Moore’s sumptuous orchestration, capture all of the affectionate whimsy of our love song to Broadway musicals. But my favorite cuts are a bluesy, mournful performance of Lonely House from the Kurt Weill & Langston Hughes opera Street Scene and a shimmering rendition of Rodgers & Hart’s A Tree In The Park, two very contrasting pictures of New York City. Nancy Kelly: Remembering Mark Murphy Featuring Randy Brecker & More!